Even when viewed through the sometimes out-of-focus lens of history, it is apparent that the human race has always been acutely aware of symbolism, particularly the symbolism of words, music, movements, flowers, metals, candles, blood, water, wine, animals, designs, objects, and especially colors. The timid, the dainty, the pastels are seen only rarely in historical symbolism. How singularly appropriate that the logo chosen to symbolize the 1990's television heroine, Xena: Warrior Princess , incorporates the pure bold royal colors of purple, white, and gold. Xena, the intrepid, the courageous, the brave, the defender, the fearless, and the bold; no dainty colors for her! Color historian Jeanne Heifetz notes that scientists estimate the human eye can distinguish some 7,295,000 shades of color, seven times more hues than the nearly 1,000,000 words in our English language. Only our own imaginative choice can tell us which royal color pertains to a particular described object. The Purple, White, and Gold Xena Trademark. 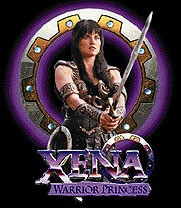 In a symbolic sense, the fantasy character of Xena was "born to the purple", and the white and the gold. She was not of royal blood since her parents ran a tavern at Amphipolis. According to Steven L. Sears, Supervising Producer and one of the writers for the show, the appellation of "Warrior Princess" was given to her by her army. It was their recognition that she was an incredibly talented leader and fighter. In turn, Ares, the God of War, was not offended by her informal promotion. The title did not put her on his level, since there is no documentation in the story that she is descended from either gods or royalty. THE FURIES (47/301), however, beclouds the issue by leaving Xena's parentage in question: Was Xena's father the immortal Ares or was her father a mere mortal man? Perhaps this will be clarified in the future or perhaps we'll never know. A subsequent episode touches on the subject of the Warrior Princess title. In THE DEBT II (53/307), Lao Ma of the Lao Dynasty shows her growing respect and admiration for Xena when she tells her, "You're going to help me run the Kingdom of Lao. You'll be my Warrior Princess"! Since Lao Ma died before she could become ruler, Xena never did become her Warrior Princess. We must then accept the fact that Sears' explanation, the only one we have to date, still stands: Xena was given the title of "Warrior Princess" by her army. The Suffrage Movement (1848 to 1920 and continued by feminists who followed) in the United States. Lydia holds an important place, not only in Biblical history, but also in women's history. In the New Testament we find her as an entrepreneur, a woman who sold the highly-prized purple dye and fabrics which were so incredibly expensive that only royalty and the very rich could afford them. A resident of Thyratira in Asia Minor, Lydia was accustomed to displaying her choice woven fabrics, dyed with Tyrian purple, outside the gate of Philippi. On one auspicious Sabbath she heard the preacher Paul, who had recently returned from Asia. She had a prosperous home, and, with her invitation, Paul and his party became her guests. Subsequently, because of his message, Lydia became Europe's first convert to Christ (Acts 16:13-15). Although white has a prominent historical presence in Christ's life, purple must also be accorded its place in history. Let us move a thousand years hence, to the year 904 CE, and to the birth of Constantine VII, also known as Constantine Porphyrogenitus. Even a slight perusal of Arnold Toynbee's review of the Byzantium Greek culture leaves the reader reeling and totally convinced that current lascivious royals could not hold a candle to that early world of machination and dark deeds, which included poisoning and castration as ways to alter the lines of royal ascension and power. Although hard for us to comprehend today, succession to the royal throne at that time was influenced more by the location of the birthing place than by parentage. Toynbee observes that "Constantine VII was not a porphyrogenitus (i.e. born in the purple) for nothing. His birth in the purple chamber of the Imperial Palace was his title to legitimacy; and this title evidently counted for much with the Imperial Court and the Constantinopolitan public..."
 Individuals, Constantine or others, might be born "in the purple" (the purple chamber), "to the purple" (of royal or exalted birth and destined to live in the public eye), or "raised to the purple" (such as today's Briton who is elevated to a peerage). Symbolically, Xena was "born to the purple" because of her innate heroic qualities and potential for greatness. In effect, however, the esteem of her warriors, rather than the circumstances of her birth, "raised her to the purple". As her fame spread, "a land in turmoil (which had) cried out for a hero," joined in acclaiming Xena, the Warrior Princess, thus reinforcing the premise, "raised to the purple". Consider now the first of our color triumvirate, purple. Even a scholar with no artistic interest in the spectrum would have to be fascinated by the history of the color purple itself. A standard purple was unknown to the ancient world. It simply meant any shade of dye that could be extracted from certain shellfish, notably the murex and buccinum. Greeks called all such shellfish porphyry, or purpura in Latin, and purple in English. The root of porphyry means to mix, to knead, or to stir violently. The glands of the shellfish contained a milky white fluid which turned from cream to yellow to green. After many stirrings and dippings in the resultant dye, the cloth would finally reach a violet to brown to black color, depending on numerous factors affecting the mollusk being used. The blatta was an especially prized shade. The Roman naturalist Pliny said the ideal purple was the "color of congealed blood". Tyre was probably the most famous of the many cities that made their fortunes from the purple dye trade. Purple was valued because of its rarity and its color. The dye was made from decaying shellfish, one stage of which smelled like rotting garlic. A 2,000 B.C.E. papyrus recorded the lonely life of the dyer who was shunned because of the smell which clung to him. Yet, in spite of its reek, Roman men and women used purple even to color their lips and cheeks. What bravery! What price regality and high status! Since one square yard of cloth required at least 20,000 shellfish, obviously only the rich could afford such fabric. Alexander the Great wore purple, sat beneath purple canopies, and walked on purple carpets. Cleopatra's flagship had purple sails. Roman senators in the days of the republic wore togas edged in purple as a symbol of royalty. The Roman Emperor Caligula covered his favorite horse with purple, in order to display his wealth. Most assuredly, the emperors of all periods did not want the undeserving to wear the royal color. When Nero observed a woman in purple at one of his recitals, he stripped her of her clothes and then of possessions. He even had the animals that appeared in the arena dyed purple. In the Bible, Belshazzar and Mordecai were honored with purple robes, a clear sign of favor. After the seat of the Roman Empire moved to Byzantium, the empresses, such as Zoe, Constantine VII's mother, gave birth in a chamber lined with purple. Thus, their children were called porphyrogenitos, or "born to (in) the purple." The purple industry went into a slump, however, when the Byzantine Emperor Theodosius, who wore a purple diadem, purple robe, purple trousers, and purple shoes, proclaimed in 424 CE that anyone caught wearing the royal shades of purple would be guilty of treason and put to death. Does not Xena's intrepidity, tenacity, valor, and heroism qualify her for the rank of regality? Does she not deserve to be "raised to the purple"? Certainly! Let us now consider the suitability of white as the second "color" for identifying Xena. Although white is "devoid of hue", it has come to represent, first of all, unsullied purity, the dove of peace, and the baby's untainted newness. However, a second facet of white is that of incandescence -- impassioned, white with fury, intensely heated, shining, and glowing. Is Xena impassioned? Shining? And now, after her reformation, pure of heart and intentions? Definitely! The history of gold is far better known. The word itself is from an Indo-European root, ghel, meaning "to shine" or "to be yellow." Gold has an important place in many legends. In Greco-Roman legend, gold was mined by many creatures, from ants to griffins. Scythians, famed goldsmiths of the ancient world, were said to be perpetually at war with the griffins who jealously guarded the mines. Gold has always been a symbolic, as well as an actual object, of great worth or goodness, valued as the finest of its kind, hence "golden" figures of speech abound: the gold prize, the golden touch, a golden voice, a golden age, a golden anniversary, a golden opportunity. Does Xena meet the criterion of being a golden leader, a leader of great value? Absolutely! Every episode confirms and re-confirms her golden worth. Women Suffrage Procession in Washington DC, 3 March, 1913. These three colors, purple, white and gold, were aptly chosen by the American suffragists who marched and struggled from 1848 to 1920 to get the vote for women, always proudly led by the color-bearers with their banners of purple, white, and gold. "I watched a river of women Rippling purple, white, and golden Stream toward the National Capitol", wrote poet Katherine Rolston Fisher in the Jan. 19, 1918 issue of "The Suffragist". Since then, periodically, the women of America have gathered in ranks behind that same combination of valiant colors originated by the National Woman's Party during the American Suffrage Movement. What is the symbolism of these three colors in the Woman's Movement? Grace Hoffman of New York City chose a pure purple to represent the Royal Glory of Womanhood, white for Purity in Home and Politics, a pure yellow gold signifying the Crown of Victory. At the birth of the Second Wave of Feminism in 1966 the same three colors, which had served civilization for so long and so well in so many capacities, were chosen for the modern woman. It is important that the women of today make historical statements whenever the opportunity presents itself. It is the only way we can express gratitude to those women on whose shoulders we stand. They opened the doors that we might pass through to greater choices than they had. 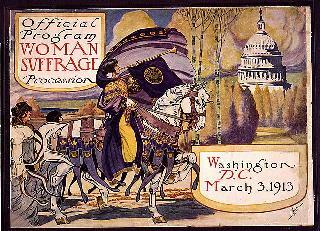 Contemporary Feminists with Purple, White, and Gold Banner and Sashes. Although the rise of the fictitious Xena to the status of full-fledged role model has been astonishing, it is also understandable, given that women have had few such public figures. We need trailblazers and role models women we can emulate. Fantastically and in fantasy, Xena's activism fills that need. Today purple, white, and gold are being re-discovered and re-chosen, sometimes without any knowledge or recognition of their unique and grand history, as the symbols of women, heroines, and super-heroines. It is altogether fitting that Xena, Warrior Princess should be identified by the historical colors of purple, white, and gold in the official Xena logo and trappings. Those colors represent her extraordinary qualities. Xena, Warrior Princess with Sword Against Chakram Shown in Purple, White, and Gold. Hail Xena! Hail Our Noble Colors! Heifetz, Jeanne. When Blue Meant Yellow: How Colors Got Their Names . New York: Henry Holt & Co., 1994. 171pp. il. Irwin, Inez Haynes. Up The Hill With Banners Flying: The Story Of The Woman'S Party . Penobscot, MA: Traversity Press, 1964. 50lpp. il. Toynbee, Arnold J. Constantine Porphyrogenitus And His World . London: Oxford University Press, 1973. 768pp. Diane C. Bonacci has worked as an activist for numerous social and political causes, primarily the Second Women's Movement. Her career was spent in the Federal Government. After leaving her position, because of a disability, she authored "Heritage Remembered", a limited archival edition relating to her family and cultural history. A graduate of CCBI in Syracuse, NY, she also attended the University of Arizona and Syracuse University. An aficionada of the old classic movies, Diane has a cinematic library and a selective collection of original movie posters. Because of the strong feminist image projected in Xena: Warrior Princess , she has become a great fan of Lucy Lawless and Renee O'Connor. Currently involved in desktop publishing and serving as a resource person for the Central New York Chapter of the National Organization for Women, Diane is proud to be a feminist.